Culture. The number one topic in today’s corporate world. Businesses try countless strategies to get their team members to enjoy each other’s company: pizza parties, outings, cycling groups, happiness seminars, etc. But most agree these attempts do little to engage employees towards feeling connected to the company and each other. They are expensive to plan and time consuming to execute. Some even require employees to use valuable off time to attend…we all know that’s never eagerly anticipated! 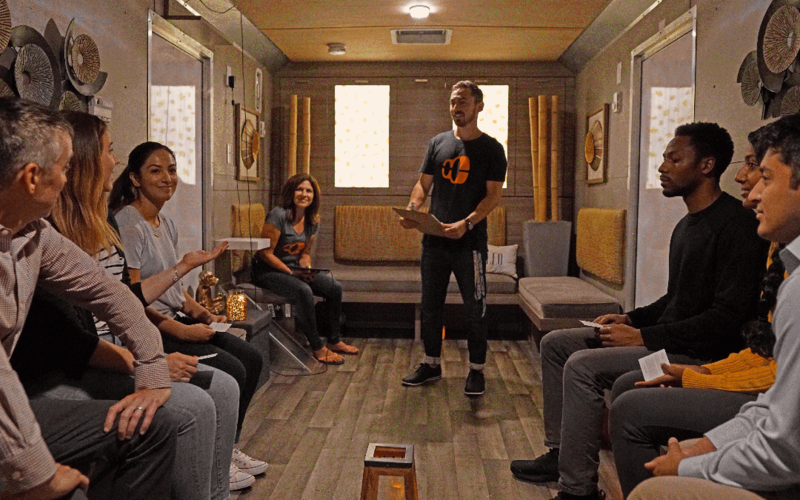 At first glance, MeditationWorks mobile meditation studio seems like a simple stress solution. We roll up to a company, team members meditate, and voila, they learn to manage their stress. But there’s so much more going on in the background. We are also solving another corporate issue that is just as important and difficult to address as stress: promoting meaningful connections between employees. Before our meditation sessions, individuals are talking to each other. From different departments, backgrounds, and cultures. They are chatting about their weekends and kids, opening doors for each other, and sharing a smile and even a laugh before all settling into 10 minutes of peace and stillness together. I’m guessing your company is trying to create a culture built upon quality relationships yeah? Enough with the pizza parties and wellness seminars. Create a quick and fun team outing, every single week, during the busy workday. Try MeditationWorks. Apply for our free trial!